How can I more stress you about the wonderful property of a bowl full of steaming noodles? If you are reading this blog you are probably from some foreign (and civilized, food wise at laest) country where noodles are a daily dish. Soak the rice noodles in hot water and let them soak until you are ready to add them to the sauce (20 to 30 minutes). Finely chop onion, garlic and ginger. Cut in stripes the pak choi, dice the pepper. Heat the oil in a wok and add onion, garlic and ginger. Let them stir fry, turning constantly, until they begin to colour. Add pepper and pak choi. Stir fry for 5 minutes. add the hot stock and let it reduce at high heat. 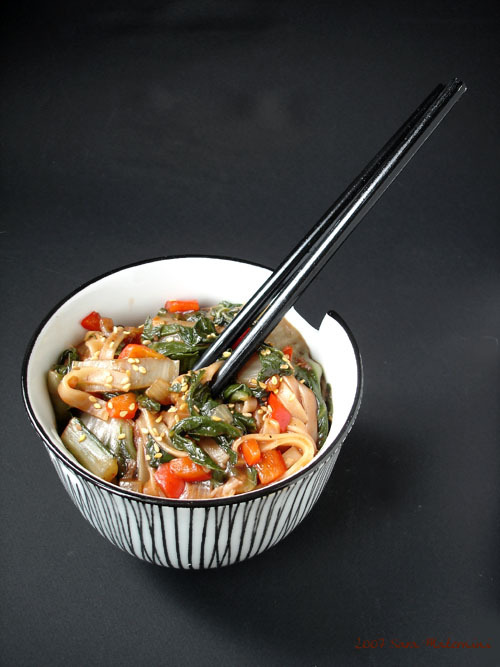 when the liquid is reduced and the vegetables are cooked, add the drained noodles, the sauces and stir well for 5 minutes, until the noodles are cooked. Serve straight trough, sprinkled with sesame seeds. how about if it results imposible to find Pak Choi? any ingredient we can use as a substitute?